The Expert Advisor manage trading operations with 1% of Auto Money Management, the goal is to achieve a few pips for each trade. When the trade goes in the wrong direction, an additional trade is open with a higher lot size (x10). You can choose, in which direction open the additional trade. 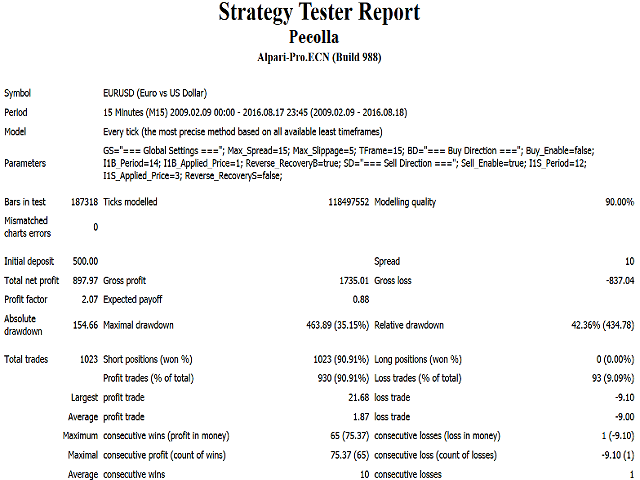 This is a non-stop loss system, the EA can work in addition with other robots but it will open the trade only if there are no open trades by other robots in the MetaTrader terminal. You can choose to manage only Buy operations, Sell operations or both with any timeframe. The robot supports any currency pair but, of course, you should backtest it before trading on a real or demo account. Exhaustive backtest has been made to find the optimal settings. In the Comments section, you can find all the backtest and .set files. I recommend to use it. In slightly less of eight years backtest the EA was never losing money, but I recommend of course to test it on a demo account for at least three months before to try it on a real one. Buy_Enable: true – manage Buy operation. If false, Buy operation is not allowed. I1B_Period: period for the first indicator. I1B_Applied_Price: applied price for the first indicator. Reverse_RecoveryB: if true, the recovery trade will be opened in the opposite direction, otherwise it will be opened in the same direction. Sell_Enable: true – manage Sell operation. If false, Sell operation is not allowed. I1S_Period: period for the first indicator. I1S_Applied_Price: applied price for the first indicator. Reverse_RecoveryS: if true, the recovery trade will be opened in the opposite direction, otherwise it will be opened in the same direction. Watch frequently the settings section to find update and new backtest.